A new type of galaxy has just been added to the galaxy zoo: a small, compact, and old elliptical galaxy that shows signs of a monster black hole actively accreting material in its center. 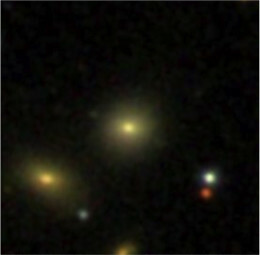 What can this unusual discovery tell us about how compact elliptical galaxies form? Compact elliptical galaxies are an extremely rare early-type dwarf galaxy. Consistent with their name, compact ellipticals are small, very compact collections of ancient stars; these galaxies exhibit a high surface brightness and aren’t actively forming stars. in an SDSS color composite image. 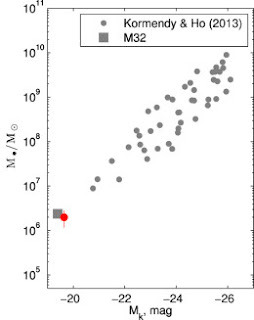 Most compact ellipticals are found in dense environments, particularly around massive galaxies. This has led astronomers to believe that compact ellipticals might form via the tidal stripping of a once-large galaxy in interactions with another, massive galaxy. In this model, once the original galaxy’s outer layers are stripped away, the compact inner bulge component would be left behind as a compact elliptical galaxy. Recent discoveries of a few isolated compact ellipticals, however, have strained this model. Now a new galaxy has been found to confuse our classification schemes: the first-ever compact elliptical to also display signs of an active galactic nucleus. Led by Sanjaya Paudel (Korea Astronomy and Space Science Institute), a team of scientists discovered SDSS J085431.18+173730.5 serendipitously in Sloan Digital Sky Survey data. The team used SDSS images and spectroscopy in combination with data from the Canada-France-Hawaii Telescope to learn more about this unique galaxy. SDSS J085431.18+173730.5 presents an interesting conundrum. Ancient compact ellipticals are supposed to be devoid of gas, with no fuel left to trigger nuclear activity. Yet SDSS J085431.18+173730.5 clearly shows the emission lines that indicate active accretion onto a supermassive black hole of ~2 million solar masses, according to the authors’ estimates. Paudel and collaborators show that this mass is consistent with the low-mass extension of the known scaling relation between central black-hole mass and brightness of the host galaxy. Central black hole mass vs. bulge K-band magnitude. To add to the mystery, SDSS J085431.18+173730.5 has no nearby neighbors: like the few other isolated compact ellipticals recently discovered, there are no massive galaxies in the immediate vicinity that could have led to its tidal stripping. So how was this puzzling ancient galaxy formed? The authors of this study support a previously proposed “flyby” scenario: isolated compact ellipticals may simply be tidally stripped systems that ran away from their hosts. Paudel and collaborators suggest that SDSS J085431.18+173730.5 might have long ago interacted with NGC 2672 — a galaxy group located a whopping 6.5 million light-years away — before being flung out to its current location. Further studies of this unique galaxy’s emission profile, as well as efforts to learn about its underlying stellar population and central kinematics, will hopefully help us to better understand not only the origins of this galaxy, but how all compact ellipticals form and evolve.